Before I had kids, seeing mommies trying to coax their child to eat frightens me. Just like my GP who told me, babies are like computers, it is YOU who decides what program to load in. With that "advice", I exposed my kids to all types of food when they reached solid food stage. I was a happy mom during meal time for a good 10 years or so until my son turns teens. It was this time that he become such a picky eater or rather selective eater. For example, he used to love Granny Smith apples but now he doesn't even look at it. He used to eat whatever is being served. Now he picks and choose. It is hard to cater to his whims especially when you are cooking for a small family as a whole. When he likes it, he can whacked two cookie jars of chocolate chip cookies within two days! When he doesn't, he won't even entertain you by eating his share! That is my son for you. Is this normal? On the other hand, feeding hubby is such a joy. He eats everything! Even bitter gourd! When I know him, his variety of food is pretty limited. Now I am glad he learns to appreciate food. Luckily, my girl takes after her dad. They have good appetite and enjoy food. It is a joy to feed them both. Now with a bag of Granny Smith in the fridge waiting for no takers, I need to turn them into something before they rot. So Apple Pie from Martha Stewart’s Pie and Tarts it will be. 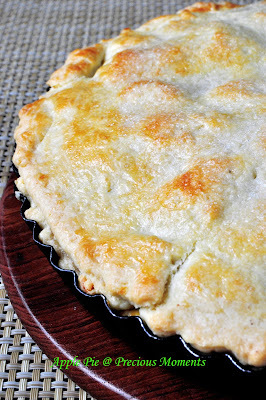 I love the crust of this pie. It is really nice, buttery and light in the mouth. The fillings could have been a little sweeter though. I used freshly grate nutmeg and boy, it definitely makes the difference. Will be so perfect with a scoop of homemade vanilla ice cream. Now I have to remind myself that I better not buy green apples the next time. Pulse flour, salt and sugar in a food processor. Add butter and pulse till fine crumbs. Drizzle in 1/4 cup water. Pulse again till it the dough comes together. Divide dough into two disc. Chill in fridge till firm. Roll according to the size of your pie pan. Chill again for approx 30 mins. Preheat oven to 200 deg. Whisk cream and egg yolk. Set aside. 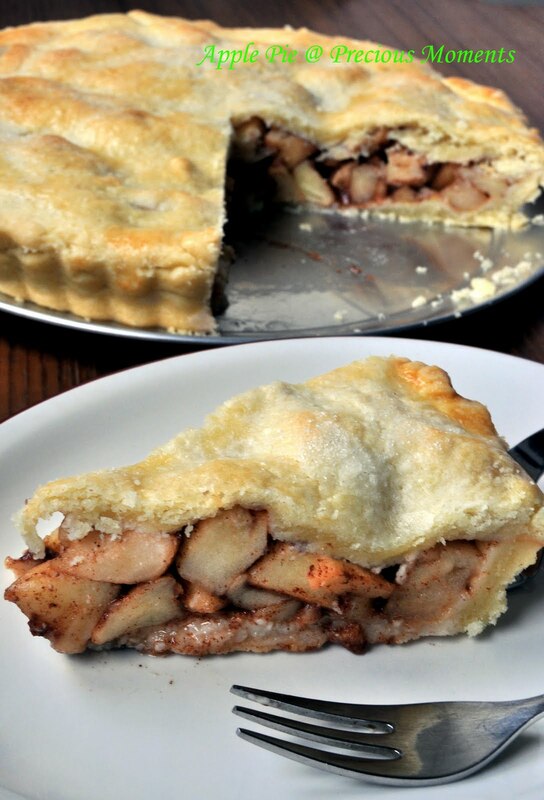 Toss apples, flour, lemon juice, sugar cinnamon, nutmeg and salt together. Mix well and pour mixture into the chilled pie shell. Piling in the centre and dot mixture with butter. Roll out the remaining disk of dough. Brush the bottom crust with egg wash.
Cover the apple with the dough. Cut slits in top of dough. Tuck and trim the overhangs. Brush pie with egg wash and sprinkle generously with sanding sugar. Chill till firm approx 30 mins. Bake on lowest rack until crust begins to turn light brown. Approx 25 mins. Reduce heat to 180 deg and further bake till curst is golden brown. Approx 1 hour. Note: High initial temperature helps the crust set quickly, keeping the crust from becoming soggy. Reducing the help helps the apples to cook without burning the crust. Remove pie and cool lightly before removing from pan to cool completely. Hi Edith, I've been following your blog for a while and I really admire how strong you are in dealing with your pressures! That apple pie looks delicious - I hope your husband and daughter enjoyed it. I usually make apple crumble (because I'm too lazy to make pie crust!! haha). Janine, the unexpected turned out that he actually love it. Eaten nearly 3/4 of the pie loaded with icing sugar. unbelieveable. Dumpling love, Thanks for dropping by. I am not that strong as you think but I am trying to keep sane for the sake of my girl.